Planning a weekend getaway to Australia's adventure capital? Book a Cairns holiday package deal and scoop up the best airfare and hotel deals. Whether you're heading to Cairns with the family or you're going on a solo trip, it's time-consuming to get everything booked. Instead of spending hours doing everything yourself, let Webjet do all the heavy lifting. We curate the top airfare and hotel specials to help you save time and money. Simply, enter your travel dates, select your preferred hotel or accommodation, and you're done! All that's left to do now is pack your bags and get ready to explore Northern Queensland! Start searching the latest Cairns holiday packages from Australia with Webjet's powerful search engine. Cairns is one of Australia's top destinations, a perennially popular holiday go-to with those travelling with family, solo or with partners. If you want to grab cheap flights, you'll need to keep an eye on holiday package deals especially between July and October. All major Australian cities like Melbourne and Perth have direct flights to Cairns Airport. The most competitive route is Sydney (SDY) to Cairns (CNS) with ten direct flights each day and a total flight time of 3 hrs 7 mins. If you on a budget, you can find cheap flights with Jetstar, Tiger Airways, Virgin Australia and Qantas. Brisbane to Cairns has the shortest non-stop journey time of 2 hrs 20 min, while Perth has the longest with 4 hrs 5 mins. Cairns packages have accommodation options for every kind of traveller including families. Whether you're looking for an all-inclusive family holiday or you want an entire apartment to yourself, there are incredible accommodation options to choose from. The Marlin Cove Resort is located on the edges of Trinity Beach. It's a stone's throw away from top restaurants and boasts an on-site spa and saltwater lagoon pool. You can choose from one, two or three bedroom apartments that each have their own private balcony. Inside the spacious rooms, you'll find a fully equipped kitchen, laundry facilities and separate dining and living areas. Heading to Cairns with a group of friends or family? Stay at the Palm Cove Penthouse. It's a top floor apartment with three bedrooms and two bathrooms. The property is a short walk from the Palm Cove Jetty as well as numerous restaurants. Spend the balmy tropical days enjoying a meal at the large outdoor dining area, take a dip in the extra large swimming pool or work on your handicap at the nearby golf course. The Reef Retreat is steps away from the idyllic Palm Cove Beach. It offers guest suites, townhouses and apartments, making it easy to fit your entire family in one place or get some much-needed privacy. The retreat blends seamlessly in with the natural surroundings and is close to some of Cairns top restaurants, cafes and bars. Located near the Great Barrier Reef and lush rainforests, Cairns is the ultimate Australian getaway for adventurous travellers. Base yourself in the city with centrally-located accommodation and go on day trips to explore the nearby natural wonders. If you need a break from all the activities, you can stroll down the palm-lined streets and indulge at the many sidewalk cafes and restaurants. 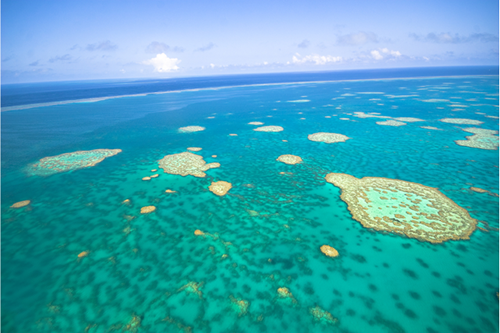 The Great Barrier Reef is one of Australia's top attractions and greatest treasures. It stretches across the ocean for more than 2,300 kilometres and is home to a dazzling amount of marine biodiversity. Spend a day diving, snorkelling or seeing this UNESCO World Heritage Site from above with a scenic helicopter tour. Kurunda is a popular day trip from Cairns. Located in the hills of the Atherton Tablelands, you can take the Skyrail Rainforest Cableway to see the Barron River and gorge. There is also the Kuranda Scenic Railway that will take you past the lush vegetation, plunging ravines and cascading waterfalls. The Cape Tribulation is home to one of the world's richest ecosystems. It's where the Daintree Rainforest and the Great Barrier Reef meet, giving you a chance to explore both attractions in one visit. Spend the day swimming in the shallow waters, relaxing on pristine beaches or exploring the rainforest. You can also go on adventurous activities such as zip lining, kayaking or diving. The best time to visit Cairns is between April and September. It's the city's shoulder season, and you'll have an easy time finding cheap Cairns accommodation and flight packages. For budget travellers, plan your trip for February or March. After the peak summer season, hotels, airlines and tour operators slash their prices to make up for the lull in visitors. It's the most affordable time to visit Cairns for adventure seekers. The summer holidays in December and January is high season in Cairns. Expect crowds at the top attractions and prices for hotels and flights to increase.